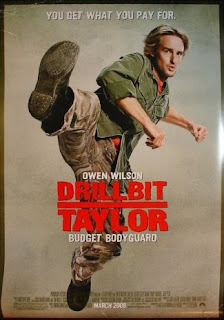 Cam's Cinematic Episodes: Film Review: DRILLBIT TAYLOR - The Blase Blonde Bungled In Budget Bodyguard Bomb. 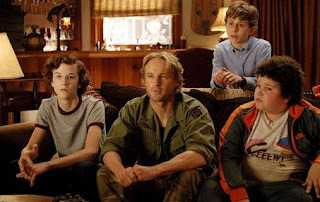 Film Review: DRILLBIT TAYLOR - The Blase Blonde Bungled In Budget Bodyguard Bomb. 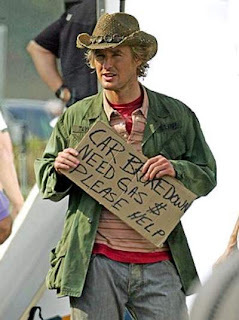 Before diving into my review of Drillbit Taylor, I have to make clear my status as a dedicated fan of the work of Mr. Owen Wilson. While the cool kids prefer to only wax poetic over the brilliance of his droll collaborations with director Wes Anderson, best displayed in the acidic The Royal Tenenbaums, I’m one of many who derives equal amounts of joy from Wilson’s carefree Zen-like performances in films like The Wedding Crashers, Meet the Parents, and the criminally underrated Shanghai Noon series. Heck, I even paid to see Behind Enemy Lines and I Spy in theatres, and if that isn’t a declaration of my fandom I don’t know what is. However, as I’ve followed Wilson’s career, from Armageddon lows to Tenenbaum highs, I’ve come to understand that the success of the Wilso n persona depends entirely on the strength of his collaborators. So, when it was announced that Drillbit Taylor would team him with mega-producer Judd Apatow and co-writer Seth Rogen, the devious brainchildren behind the fresh and hilarious trifecta of The 40-Year-Old Virgin, Knocked Up and Superbad, I was nearly giddy with anticipation. Sadly, however, sitting in the darkened theatre my excitement quickly began to dwindle. It’s an established rule that the success of comedy depends heavily on tonal consistency, and in that regard Drillbit is a mess. 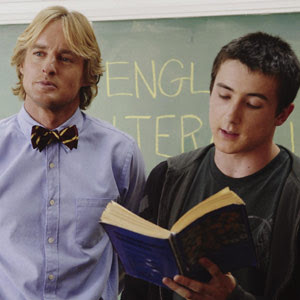 It's unfortunate, as the set-up is perfectly serviceable, with Wilson playing the titular character, an aimless drifter and U.S. army deserter, who is hired by three geeky high school freshmen (Nate Hartley, Troy Gentile and David Dorfman) to act as a personal bodyguard against a pair of nasty bullies. Initially seeing the hopeless trio as an easy way of financing his trip to the promised land of northern Canada, he worms his way into their lives, in filtrating their school as a substitute teacher. However, as the viciousness of the bullying increases, Drillbit must decide between friendship and financial gain. While the plot works on a superficial level, the film is a hopeless study in disjointedness. The world inhabited by the teens and Drillbit is a cheerfully sunny suburban California landscape, where adult authority is nearly non-existent, except for punch-lines and dramatic necessity. As well, the teens are bland carbon-copies of the hilarious Superbad trio (Including a truly pathetic attempt at a mini-McLovin), who are so innocuous that they might as well be members of the Little Rascals. The problem is, these elements clash horribly with the bully subplot, which is so violent that it becomes disturbing. The bully, played by Alex Frost, who starred as a Columbine-like killer in Gus Van Sant’s Elephant (Bizarre type-casting or coincidence? ), is so relentless ly grim and psychotic that he drags the film down every time he appears. Bullying is rarely funny, but less so when there are actually attempts at committing murder. A talented supporting cast of comedic talents also fail to connect. Stephen Root, Adam Baldwin, Frank Whaley, David Koechner and Danny McBride are all wasted, with the audience expected to find hilarity simply in their being there. Only Leslie Mann, as a randy English teacher, manages to consistently deliver. The scenes featuring her and Wilson riffing off each other are sharp and clever, and hint at what the movie really should have been about. Wilson does what he can, though he has fewer moments of blasé brilliance than usual. It’s always brutal to wa tch a comedic actor flounder, and the whiff of desperation grows stronger throughout the film. He gets little assistance from director Steven Brill, who continues his streak of slap-dash film-making, as previously on display in the Adam Sandler “classics” Mr. Deeds and Little Nicky. Drillbit Taylor isn’t a horrible film, simply a woefully misguided one. Here’s hoping that it’s only a temporary set-back for Apatow, and that Owen Wilson will return and amaze us all anew in the forthcoming Night at the Museum 2: Escape from The Smithsonian... Well, I can hope, can’t I? P.S. : Rap battle scenes never have been, or never will be funny. This movie is further proof of that fact. Word. You loved that rap off and you know it!!! !